1969. It was the summer that Hurricane Camille nearly wiped Biloxi, Mississippi off the map (I found myself there ten years later in USAF Tech School). The NY Jets defeated the Baltimore Colts (yes, Baltimore) in Super Bowl III. Nixon was sworn in as America's the 37th president. The Beatles gave their last public performance. Golda Meir became the first female prime minister of Israel. Ted Kennedy had his infamous Chappaquiddick incident. I turned 11 years old. The first permanent ARPANET (precursor to the Internet) connection was established. Sam Walton incorporated Wal-Mart. The Brady Bunch premiered on TV. Boris Karloff died. The first Vietnam war draftees were selected. The Woodstock festival was held in upstate New York. Charles Manson and his cult murdered Sharon Tate. The first ATM was installed in Chemical Bank in Rockville Center, NY. Oh, and the United States of American landed the first humans on the moon. All the media are filled with stories celebrating the 40th anniversary of the Apollo 11 moon landing. It was on July 20, 1969, at 4:18 pm EDT, that lunar lander commander Neil Armstrong radioed those second-most-famous of his words from the moon, "Houston, Tranquility Base here. The Eagle has landed." Thirty seconds of fuel remained; a miscalculation of distance in the planning caused pilot "Buzz" Aldrin to have to fly beyond a crater, pushing the craft to the very edge of its capability (remember the early Lunar Lander video games that were quite difficult to master?). President Kennedy's belief "...that this nation should commit itself to achieving the goal, before this decade is out, of landing a man on the moon and returning him safely to the earth," had been fulfilled. Due to a lack of atmospheric dispersion, objects look closer than they really are both in real life and in photographs, hence the erroneous measurement based on reconnaissance craft. Subsequent landing crews trained ahead of time to judge distances based on shadow lengths of known objects, like their own heights. Even tasks as simple as collecting lunar samples were noticeably affected. A mere 6½ hours later, Armstrong's most-famous words were spoken upon descending the Eagle's ladder, "That's one small step for a man, one giant leap for mankind." NASA just recently found and restored some of the videos that had been missing for decades. Like most school kids of the day, I eagerly followed the space program, and was very involved in model rocketry. I vividly remember the first time I ever saw a television set in my school - it was on Wednesday, July 16, 1969. The entire student population of Mayo Elementary School gathered in the lunch room / auditorium to watch Apollo 11 liftoff from Cape Kennedy (aka Cape Canaveral) at 9:32 am EDT. 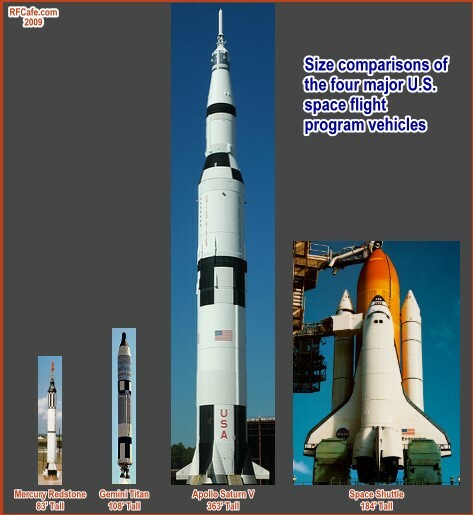 Notice how slowly the pre-Shuttle era rockets accelerated. The shuttle goes up like a bottle rocket (I had the great pleasure of watching the launch of STS-76 from the causeway at Cape Kennedy in March of 1996). Splashdown on Thursday, July 24, 1969 at 9:15 am EDT, was the second time we ever had a television set on in the school. Do you remember watching the cameras from aboard the recovery ship USS Hornet bouncing all over the place waiting to get the first shot of the Apollo module beneath its three parachutes? The Columbia module splashed down 13 miles from the USS Hornet, which is not far by car but is far by aircraft carrier. All three astronauts, Neil Armstrong, Michael Collins, and Edwin 'Buzz' Aldrin, Jr., were put into a detoxification chamber before being exposed to the Earth's environment lest an unknown Moon virus be upon them. An anxious world cheered their emergence from the chamber. Estes model rocket company was of course also closely following and promoting the space program. They had a deal whereby if you launched any model rocket on the same day as the Apollo 11 liftoff (or was it the moon landing?) and sent in a letter testifying to the launch, they would send you a certificate stating that you had supported America's moon landing effort. I, of course, dutifully launch a model rocket on that day (probably an Alpha) and received a certificate; . Unfortunately, like everything else from my childhood (my own fault), it was lost. Back in those days, model rocketry and model airplane hobbies were very much concentrated on not only flying but on design, building, and flying. Newsletters and technical bulletins were published to foster youngsters' interest in space flight and aviation. I learned about thrust and drag, recovery systems, the phases of rocket flight, specific impulse, center of gravity, stabilization, model building, and much more from those publications. 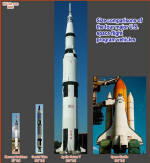 Nowadays, most model rockets come pre-built or largely prefabricated. Same thing goes for model airplanes. Oh well, somebody else's loss, I suppose. Did you see the video clip I posted of the 1/10th scale Saturn V launch? On April 25, 2009, the 36-foot-tall, 1600-lb "model," powered by 9 rocket motors producing 8000 lbs of thrust, experienced an absolutely flawless launch and recovery. Incredibly, the gigantic 1st stage landed standing up! More often than not, large projects like this fail to execute - usually due to a recovery system malfunction. With all the passion I have had for airplanes, rockets, helicopters, parachutes, and basically anything that leaves the Earth and returns in relatively good condition, one might think I would have ended up spending my life pursuing it/them professionally, but alas, it did not turn out that way. I have managed to fly in a few helicopters and airplanes (even began but did not complete a pilot's license), but have never parachuted or blasted off in a rocket (OK, not many people have). Once, though, I did manage to do something very few people have done - I sat inside an actual Gemini space capsule that had orbited the Earth. Read about it here in, "My Astronaut Days of Yore." Mostly, though, my airborne endeavors have had to settle for the less time-consuming and less expensive option of modeling; that is not a bad second choice. My other passion is electricity and electronics, so at least I have gotten to engage for a lifetime in something I enjoy; not everyone is so fortunate. December 17, 1972, Apollo 17 astronauts were the last humans to step foot on the moon. They were also the last humans outside low Earth orbit. Succeeding missions concentrated on space laboratories, including Skylab and the International Space Station. One of the primary purposes for the space station experience is to gather information on and gain experience in extended stays in zero gravity environments, with the ultimate goal of launching a manned mission to Mars. As with the Moon program, there are those who object to spending money on a Mars program. Perhaps the unfortunate good news for them is that it might be a country other than the United States - China - that will be able to claim rights to our nearest superior planet. The first human Mars visitors might well be taikonauts. Many benefits have resulted from the space programs of all nations, so opposing the investment based on cost alone is rather foolish. If not for the technologies developed in transportation, materials, food production and preservation, medicine, survival techniques, power generation and storage, computers and software, electronics, optics, mechanics, chemistry, biology, physical fitness, and so much more, we would not have the ability to assist the world's needy with the efficiency that we do now. Do a search on the spinoff technology resulting from space program research; they go well beyond the digital watch and metalized survival blankets. It would be impossible to motivate the great multitudes of engineers and scientists who engage in commercial enterprise to innovate with such passion if the only incentive was to tend to the less fortunate. Maybe that is a sad statement, but it is true. Utopian, socialist societies have always failed because of human nature. Ultimately, each person must be allowed to follow his dream in order for happiness to drive creativity. I am glad that NASA has chosen to make a big deal of the 40th anniversary of the moon landing, both because it is a good way to reinvigorate the public's enthusiasm for space exploration, and because by the time the 50th anniversary rolls around in 2019, I will be 60 years old and might have already assumed room temperature. Are you old enough to have witnessed the Apollo 11 mission's progress? Were you one of the lucky few who people who watched the launch from Cape Kennedy?